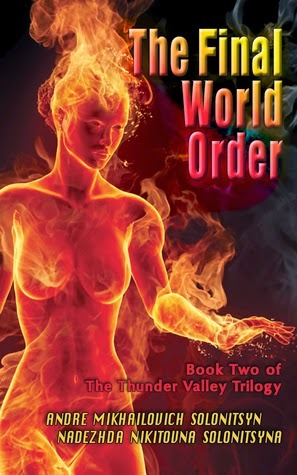 "The Final World Order," the second book in the The Thunder Valley Trilogy, is a fiction novel about politics and humanity that includes lots of adventure, action, and suspense. One of the things that sets this series apart is that the reader is shown world leaders working together to save humanity. Most novels paint world leaders as evil, so this series has felt very fresh to me. While in the first book of the series ("The End of the Computer"), the reader becomes familiar with the people of the valley and the enigmatic nature of advanced computer AI. "The Final World Order" gives the reader an indepth look at Eowyn's secrets and the rest of the characters from the first book. As engaging as the plot is, it is the characters of this book that really shine. They are incredibly dynamic and well-written, and I found myself really....surprised at some of their decisions. Which is good. The last thing I want in a novel like this is predictable characters. The one thing I must warn potential readers -- if you're going to buy this book, set aside a day to read it. It's that engaging. Overall, a fantastic read with well-rounded characters and an engaging plot, recommended!